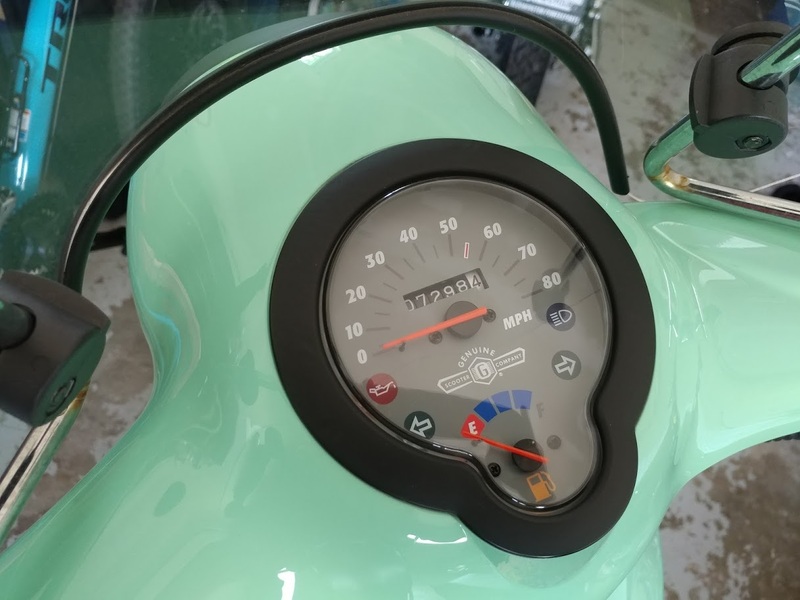 Not sure if anyone’s still following this blog anymore, but I figured I’d let everyone know that I’ve moved my Mia-related ramblings over to Adventures with Lapis and Mia, where I post about both my car and my scooter. Feel free to follow me over there! I’ve got her back, you guys. When my stepfather-in-law Don pulled up with Mia in the back of his truck, I leapt to the window like a cat (and almost fell off the couch, like a cat) I was so freaking excited. I had to try not to flail the entire time Ross and Don rolled her off the truck. She’s a little dinged up, thanks to some jerk fratboys who knocked her over last fall when Damion had her up at Purdue, but it’s nothing a little TLC and conveniently placed stickers can’t fix. This Pearl Point sticker is hiding a crack in her front plastic. I can’t think of a better use for a Pearl Point, hah. Plus, the non-sunbleached areas left behind from her old swirlies look really cool. She rides as good as ever, thanks to a new spark plug, new belt, and fresh gear oil (many thanks to Don for taking care of that!) – and she feels so zippy and nimble. (I think me losing 20 pounds since the last time I rode her regularly might have something to do with that…) I should probably swap out her slider weights at some point, but I’m gonna need some help with that – I wonder if I can convince Scott to help with that. If not, I guess Mia will be taking a trip up to Indy or down to Jasper (where the nearest Genuine dealerships are) in Haku, my friend Kasi’s truck. I rode her down to Cascades, like I do for my first trip with whatever scooter I end up taking care of for a bit (or owning a second time, in the case of Mia and Scooterlou), and I just about cried when I got her down to my usual parking spot by the tree in the lot I typically park in. 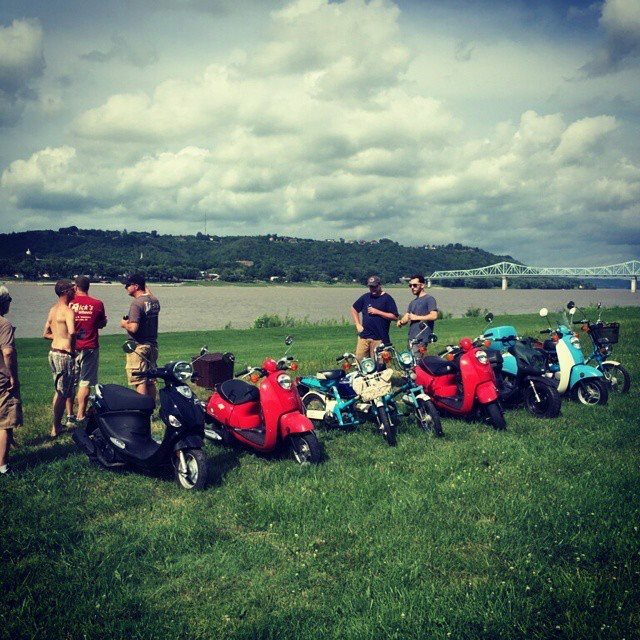 There was a scooter-shaped hole in my life for a year, and I kind of got used to it. I covered over that hole with getting more used to driving. I tried to fill it with trying to learn how to ride a motorcycle. (That didn’t go well.) 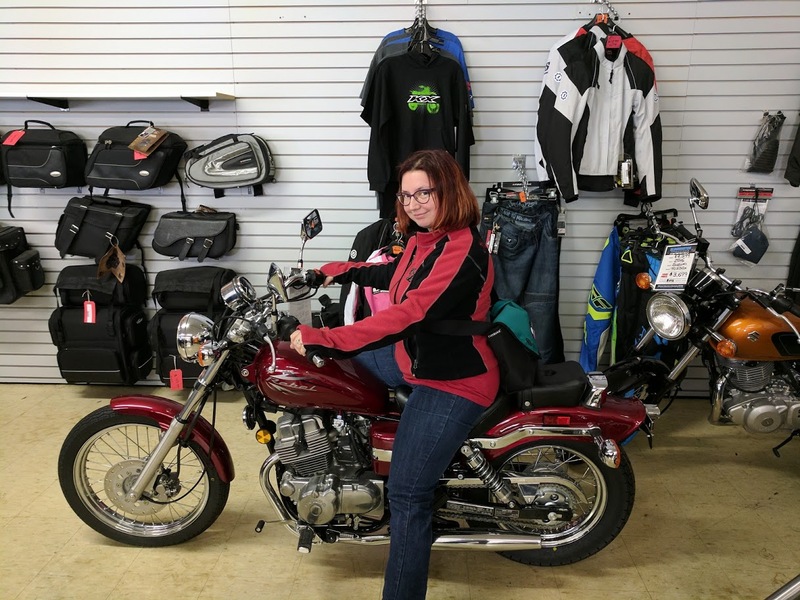 I did get to fill it briefly when I borrowed Worf, J’s amazing Honda Reflex, but you know me and old Hondas – we don’t get along very well – and I eventually gave up on riding him, because I could never get him warmed up enough before I went riding. I got spoiled by Mia – when the weather’s nice, just fire her up, give her a minute, and off we go. … remember how I said I was wrapping things up at The Lady Scooterist? Yeeeaaah, that’s changed. Because guess who’s coming back home, in a week and a half. Long story short: Last year I sold her to my brother-in-law, who loves her as much as I do. So much so that when he got a car, instead of selling Mia, he asked if I wanted her back. I almost cried, I was so happy to find out I’d be getting Mia back. My Mia Scooterbutt, my Mimi, my Miss Strawberry Farts (at least while I was giving her the strawberry scooter oil). I didn’t realize just how much I’d miss scootering until she was gone. I mean, driving is nice and all (for example, today it rained, and I didn’t have to gear up in my ridiculous pink rain suit to go to work! ), but it’s not the same as scootering. And I still haven’t learned how to ride a motorcycle – Ruby’s sitting in the garage, gathering dust. I’ll maybe learn eventually, but the drive to learn is a little weakened because I’m getting Mia back. I didn’t cry when I sold her, because I knew I’d be able to see her again – when Mia wasn’t with Damion at Purdue, she was in my mom-in-law’s garage, where I could awkwardly hug her trunk when nobody was looking. I even got to ride her for a bit on Thanksgiving, even though I totally didn’t bring enough gear to keep myself warm. (I apparently forgot how to dress myself for cold scooter riding over the course of 4 months…) But I’m pretty sure I’ll cry when I get her back. I’ve missed her. I hung onto all my old scootering gear, like the scooter kilt and most of my scooter t-shirts, figuring I’d eventually get another scooter. 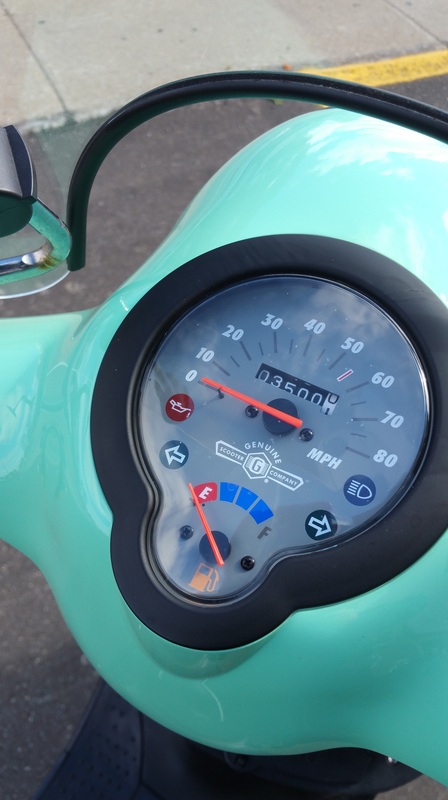 It wouldn’t be the same as having Mia, but I’d still have a twist-and-go scooter to go cruising around on. Now, I don’t have to worry about that – I’ll have Mia again. 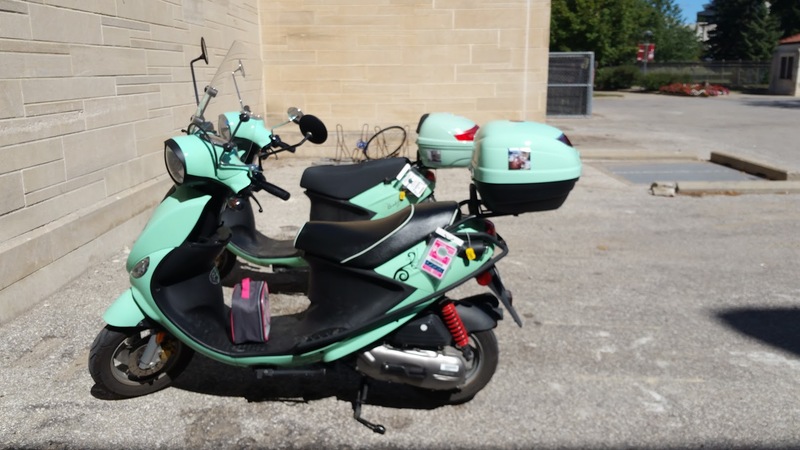 We’ll zip around Bloomington together, and park on sidewalks, and I can be “the girl with the green scooter” again. I’m gonna have Mia back soon, you guys, and you have no idea how happy that makes me. 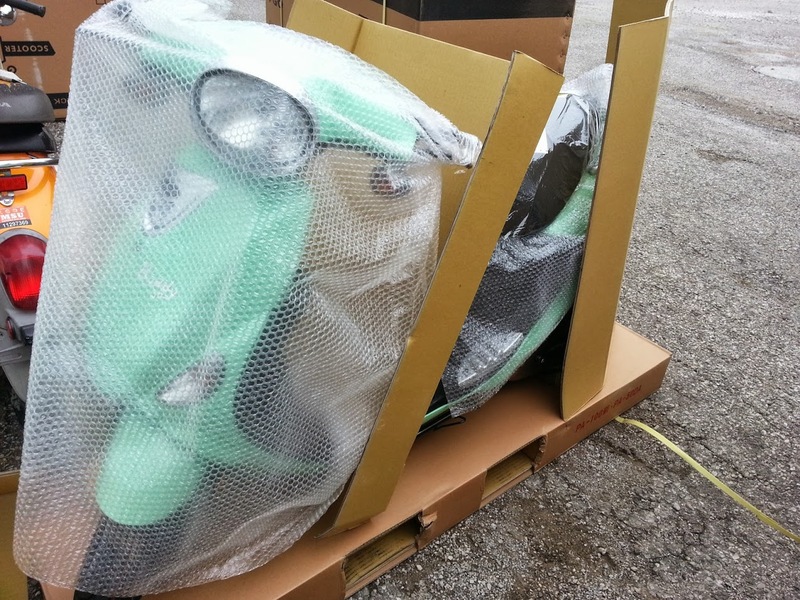 5 and a half years, three scooters, a moped, and nearly 10,000 miles…. 1: I finally got my driver’s license. That’s right, I can legally drive a car without a responsible adult supervising me, according to the state of Indiana. The little black car closest to the camera is my new ride, Lapis Lazuli. 2: I bought a motorcycle. Yes, a motorcycle. Her name is Ruby. Yes, it’s a red Honda, just like little Scooterlou – only she’s 5 times as powerful, engine-wise. Amusingly enough, she was sitting in the same exact spot at Bloomington Power Sports where Scooterlou was when I bought her. It’s clearly fate. Another reason I’m stepping out of the scooter world, for the time being anyway, is that Wick’s Wheels closed last December – and as Mia gets older and things start to fail on her, I won’t have anyplace to take her to get her patched up. As it stands, Ross and I had to learn to replace Mia’s front brake pads on our own, with some help from Modern Buddy and YouTube, and even then it was a slightly harrowing experience. Thankfully, she’s not my daily driver anymore, but I still want something that I can easily get fixed if she breaks. Given that I couldn’t find a Honda scooter that I fell in love with quite like Ruby, my new Honda Rebel, I decided to go the motorcycle route for the time being. Someday Ross may get a Vespa, and I’ll definitely ride the heck out of that, but for the time being, I want something faster, and something a little more challenging and exciting to ride. It’s been a fantastic nearly 7300 miles on Mia, as well as 2000ish miles on Scooterlou, and however many miles I put on Max (who I ended up trading in for a performance exhaust and a new riding jacket last year, heh – he never would start for me!) and Neelix (who I still see around town). Thanks to all my scooters, I got brave enough to get on the road and eventually get my license – and gain my independence. And hopefully, whoever ends up with Mia (honestly, I’m hoping my mom-in-law takes her!) will have many, many more fun miles with her. Max’s odometer reading: 4542ish miles, maybe? Oh man, I’ve been slacking a LOT when it comes to scooter blogging. 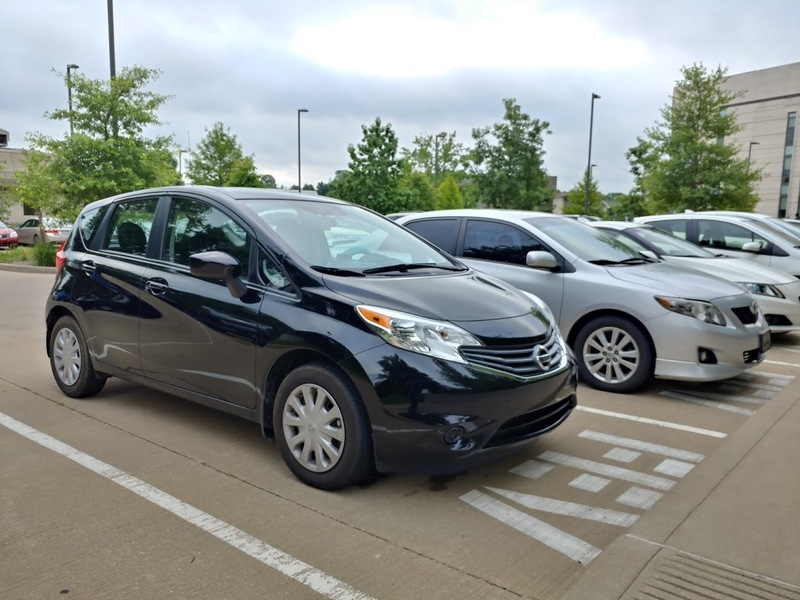 First off, Neelix (the Honda Express I had for a bit) somehow magically turned into a Honda Elite while I wasn’t looking. His name is Max, he’s a 1989 Honda Elite 50, and he’s being a jerk right now, but that’s what happens with ancient scooters, right? They’re finicky. Especially old two-strokes, as I’m finding out. I love him to bits, though – he’s my little spaceship scooter. Mia has officially been to a farm now – a tiny one, but still a farm. The newest member of the family – Garnet. So that’s what’s been up in the life of the Lady Scooterist. Hopefully, with the larger amounts of riding I’m doing this summer, I’ll actually have more to post. I knew Mia would end up having issues just after her warranty expired. Don’t ask me how I knew. I just had a feeling. And, oh, she’s had some issues. Like slowing down from 35-40 mph to a sluggish 20 mph on short notice. Typically on roads where the speed limit is 40 mph and I’ve been running wide open throttle for a bit. The guys at Wick’s Wheels found mysterious metal shavings in her gas tank. Nobody knows how they got there – their appearance mystified everyone at the shop. Michael (the scooter mechanic) cleaned them out with a magnet, popped on a new fuel filter, and thought that’d be the end of it. Nope! She still had issues after that, which resulted in another trip to the shop. This time, she was ridden around for a bit by Bryan and Scott before swapping out her spark plug. They couldn’t get her to stall like I did (why does she always behave for others? ), but they figured the spark plug was the next likely culprit, and it looked pretty gross when they pulled it out, so if THAT doesn’t fix it, the next thing they’re going to do is swap out the CDI. Somewhere in there she hit 3500 miles, in the parking lot of Wick’s Wheels – Bryan was kind enough to let me hit the 3.5k mark on her myself, he stopped his test riding just so I could hit that milestone. Guess I’m just meant to always have a Honda in my garage. So my ebike magically turned into a moped yesterday. 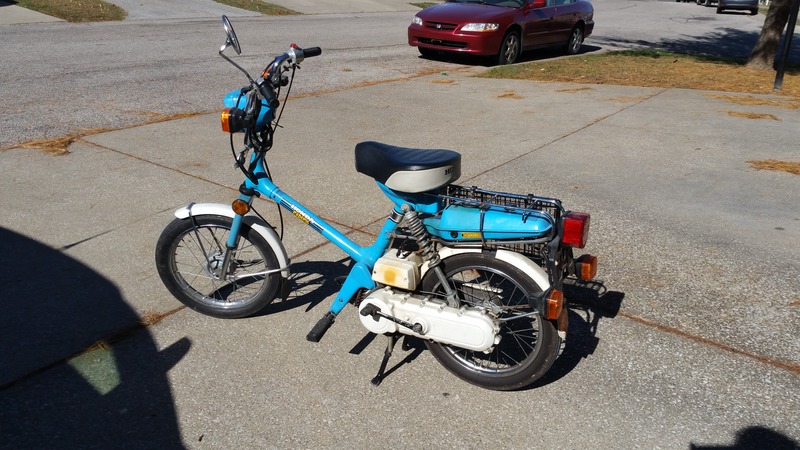 A 35 year old Honda Express, with pretty much all of its original parts (minus the rear tire mudflap, a chunk from the middle of the rear tire fender, and the right hand mirror). And boy, is it fun to ride, even though it goes slower than Scooterlou ever did. I think I’m in love. So many Seafoam Buddies! Mia’s in front, of course, Barnaby’s to her left, and directly behind her is a new Buddy! Sunday was Mia’s 2nd birthday! Two whole glorious years of riding the best Buddy that Genuine ever made. Mia, fresh and new and not quite out of the box yet. We’ve been through some good times together this year – like all those lovely rides to and from work, and the rides for pleasure I take (although less frequently, now that Hoosier Ride isn’t so much of a thing anymore, and since Ross is waiting on the registration for Big Macintosh to come in the mail…). We’ve also been through some scary bad stuff. Like that thunderstorm back in early August, where we had to pull over and ride out rain so bad that I couldn’t see more than a foot in front of my face, where her turn signal relay died because it filled with water, and where I had to drag my poor girl through knee high flooded streets because, well, it was that bad out there. And yet she still managed to start up after I dragged her through those puddles! I swear, she’s made of magic or something. Mia, from a few days ago, hanging out with her buddy Barnaby. I love her, and I’m glad I have her. Don’t tell Scooterlou, but I’m pretty sure Mia is the best scooter ever. 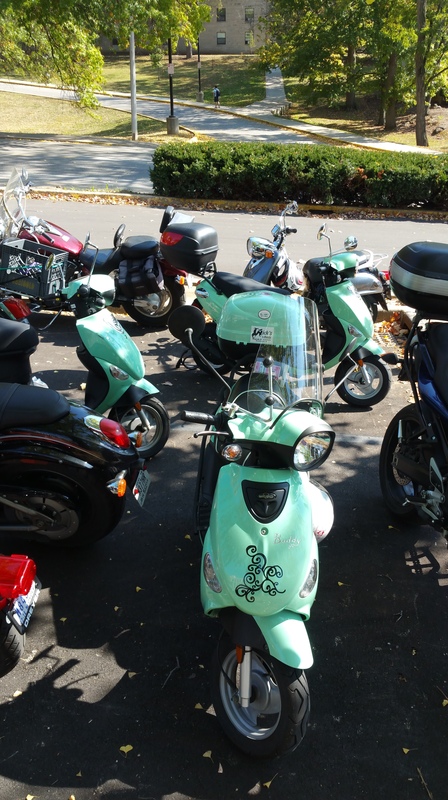 Scooterlou, amongst the Wickersham family’s collection of Metros and other scooters..
Well, it’s kind of a bummer that it had to happen, but I ended up selling Scooterlou again. 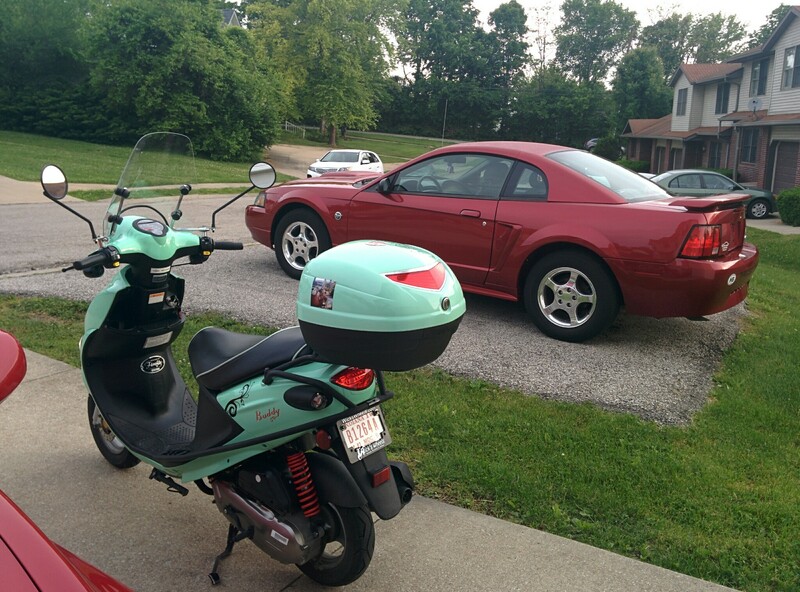 With summer rolling around, I found I didn’t really ride her much, and with the fact that I got a car recently (yes, a CAR), I figured it’d probably be more responsible to just keep one 50cc scoot. (And I know Scooterlou went to a good home – I sold her to one of Scott’s brothers, and she’s now part of a herd of Metropolitans, which is awesome.) So, it’s just me and Mia again. And Janeway. Yup, that pretty red Mustang in the back is Janeway, my new-to-me car. She’s a 2004 V6, a 40th Anniversary edition, and while her upholstery inside is kind of a mess (someone spilled something in there at some point in the past, and oh the gross stuff that came out of the seats when I tried to carpet shampoo them), she purrs like a very large kitten when she’s running, and I’m super excited to be learning how to drive her this weekend.